Activated Carbon is the best general use adsorbent to remove/reduce a lot of organic and some inorganic contaminants found in different liquid and gas products. 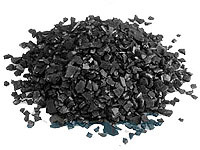 Activated carbon has the unique ability to adsorb a wide range of compounds from both the liquid and gas phase. This adsorptive feature is responsible for removing contaminants from water and other substances where the adsorbent material is added. Activated Carbon features a highly crystalline form with a wide surface area and extensively developed internal pore structure. Surface area is used as a primary indicator of the activity level, based on the principle that the greater the surface area, the higher the number of adsorptive sites available. The macropores are used as the entrance to the activated carbon, the mesopores for transportation and the micropores for adsorption. Different types of Activated Carbons can be produced with specific characteristics depending upon the raw material and activation technique used in their production.